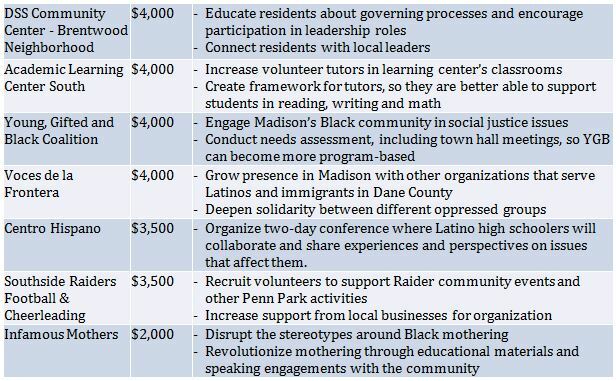 Madison, WI (November 15, 2016) – Seven local, grassroots organizations will receive United Way of Dane County grants ranging from $2,000 to $4,000, totaling $25,000, to further their work in reducing racial disparities, engaging community members and bringing equity for all. United Way offered $25,000 to small organizations that are working in the areas of equity, social justice, community organizing and volunteer management with the goal to broaden support to community and neighborhood-based groups beyond our traditional nonprofit partners. When this process began in July, 49 organizations submitted more than $232,000 in requests. These grants will be used in 2016 and the first quarter of 2017. Each organization will report back to United Way’s CE CBT on progress and results.